So far I’m up 20 lbs. My eating is basically back to normal. I still can’t eat too much sugar (makes me sick) but I don’t have to eat every 2 hours. Spicy stuff gives me heartburn, but I haven’t gotten to the point where EVERYTHING gives me heartburn so that’s nice. All in all a pretty nice point in pregnancy. 20 weeks is a nice time, agreed. Not to the point where milk gives you heartburn? That’s a terrible day to reach. I was wondering, when do you get checked for gestational diabetes? Are you prepared for that crap again? I’ll probably ask next appointment about getting tested. 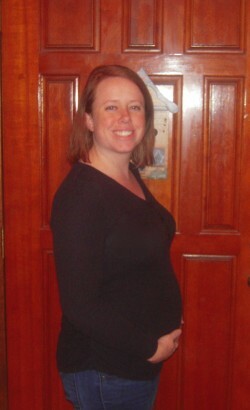 Usually 24-28 weeks. And yeah, I’m ready. You look so cute! Every time I look at you, you just look like such a nice, sweet person. I bet you’re a great mom. Congrats on halfway!